YouTube is the world’s most popular video website, and many of your online personalities started right there. Our very own Jon Rettinger, Mark Watson (SoliderKnowsBest), and yours truly have all started their tech loving careers on that very website. YouTube is a fantastic medium to convey and acquire knowledge, and contains everything from people falling in fountains while texting, to instructional videos on how to subnet a network. The one thing YouTube has been lacking is the ability to stream live content. In fact Jon and Mark frequently broadcast live on UStream, one of many streaming services. There are numerous streaming options, but I have found they all lack one feature or another, so there is definitely room in the market. Enter the YouTube streaming service which has now moved out of Alpha and into Beta. The initial testing last Sept. was highlighted by two days of live streaming events from select content partners. To say that those tests were a failure would be an understatement, with low viewer numbers and poor quality streams. Most viewers complained about poor audio and jumpy streams and the whole experiment just didn’t go well. So now with the Beta upon us, YouTube has been keeping pretty quiet about the upcoming offering. Select partners will be given the ability to stream live content, but they will be responsible for the promotion of these streams, unlike the alpha where YouTube, in essence, took care of promotion. The biggest test took place on Jan. 18 when Revision3 broadcast their popular show DiggNation on what host Kevin Rose deemed “YouTube Live”. The show implemented a three-camera system and included all of the same effects that are available as part of it’s on-demand content. This second effort at live streaming for YouTube was exponentially better than the alpha attempt, but still had a few “lag” issues. It looks like YouTube is getting closer to releasing this to a number of partners, when is the last standing question. I am not sure how YouTube will determine which partners have live streaming capabilities enabled on their account, or even when this might take place. What I can tell you is that this feature is not enabled on my account, nor a number of friends and acquaintances who are also partners. If you are a YouTube partner keep an eye on your account and let us know if you account has been enabled for live streaming. 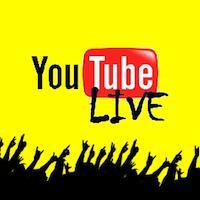 It will be interesting to see if the live streams become as popular as the rest of the YouTube ecosystem. 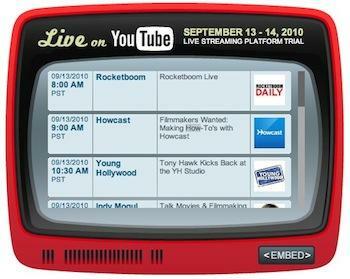 What would you implement in this streaming model that isn’t in other services like UStream or BlogTv? Let us know in the comments below.